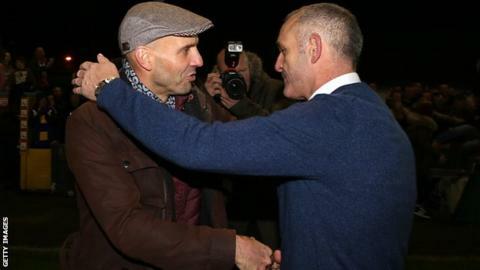 Exeter City boss Paul Tisdale may be the longest-serving manager in the Football League, but his time in Devon has not been kind to him in the FA Cup. He famously led university side Team Bath to the first round in 2002, a run that first brought him to prominence. But he has only won twice in the FA Cup in more than nine years as City boss. Last year they lost to non-league Warrington Town live on television, a fate which they could suffer again this season as they prepare to face Didcot Town. Along the way the club has lost to Curzon Ashton, Bury three times and MK Dons, and have only beaten Nuneaton in 2009 and Stevenage in 2007, both of which were playing non-league football at the time. "There's no disputing that we've had a poor FA Cup record of late," Tisdale told BBC Sport. "There's two parts to that - one is we've certainly not performed well enough in certain games, and that's obvious. A lot of the misery has been of our own downfall. "The other thing is of the past 12 FA Cup draws we've had, 11 have been away. That doesn't help. "But we have to learn from those lessons. It is a game of football, it is 11 v 11 and we have to make sure we don't come unstuck like we did last year. "It's more of a mindset. It's certainly not an attitude or a commitment on wanting to win or thinking it's not important, that's not the type of mindset I'm talking about. "I'm talking about the way the game needs to be played in order to put it in our favour." But how do you prepare for a team that you may never have even heard of, let alone seen play, at a ground with facilities that your side of professionals are not used to? "There are things you just can't control," said Tisdale. "You go to a non-league ground and you can't control supporters sat on top of our dugout like last year, we can't control the man with the key locking us out of the dressing room and disappearing with us stood outside - we can't control those things. "What we can control is what we do on the pitch. We've got some situations we need to follow and plenty of the players have got the experience of last year to fall back on and we need to be professional and do the job and prevent it happening again." The FA Cup saved Exeter almost 11 years ago when a financially-struggling Grecians side drew 0-0 with Manchester United in a money-spinning tie at Old Trafford, before losing out to Cristiano Ronaldo, Wayne Rooney et al in a live televised third-round replay. But, despite Exeter's poor recent FA Cup record, Tisdale refuses to get emotional about what a run in the competition would mean to his side. "Any win's a good win when you're a professional footballer or a manager," he said. "It's a professional mindset. If we start getting into the emotion of it then it becomes a very different type of game. We will win this game by being professional, not by being emotional about it."